The Sims 4 is coming. Many of us have seen demos and some of us are even lucky enough to have the CAS Demo. Thanks to friends that do have it, we were able to do some testing with The Sims 4 CAS demo and update the Blender plugins so Sims 4 animations and poses are now possible. Orangemittens has tested the plugins and created this new test animation. The download is right below the picture. 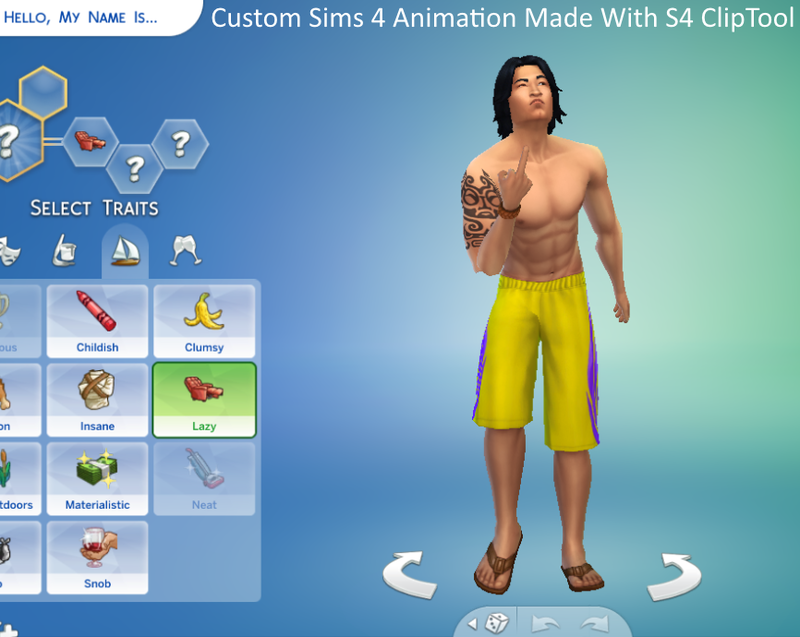 Because the only way to play an animation at the moment is using a default replacement, this first custom animation is a default replacement for the animation you see when you select the Lazy Trait in the CAS demo. You will need the CAS Demo to play this animation until the game is released. To use it simply drop the .package in the mods folder for your CAS Demo game. Then go into CAS and select the Lazy Trait. The original EA lazy trait animation will be replaced by this default replacement. If you have the CAS Demo please try the animation and post whether it worked for you. All feedback is much appreciated. This custom animation was packaged using s4pe which will soon be available at the Sims4Group Site. Documentation on the Sims 4 CLIP resource is available at the Sims4Group Wiki. This .package is cross-posted at Simlogical – Thank you Inge!